Then Jesus used another story to teach them. Jesus said, "The kingdom of heaven is like a man that planted good seed in his field. That night, all the people were asleep. The man's enemy came and planted weeds among the wheat. Then the enemy went away. Later, the wheat grew and heads of grain grew on the wheat plants. But at the same time the weeds also grew. Then the man's servants came to him and said, 'You planted good seed in your field. Where did the weeds come from?' 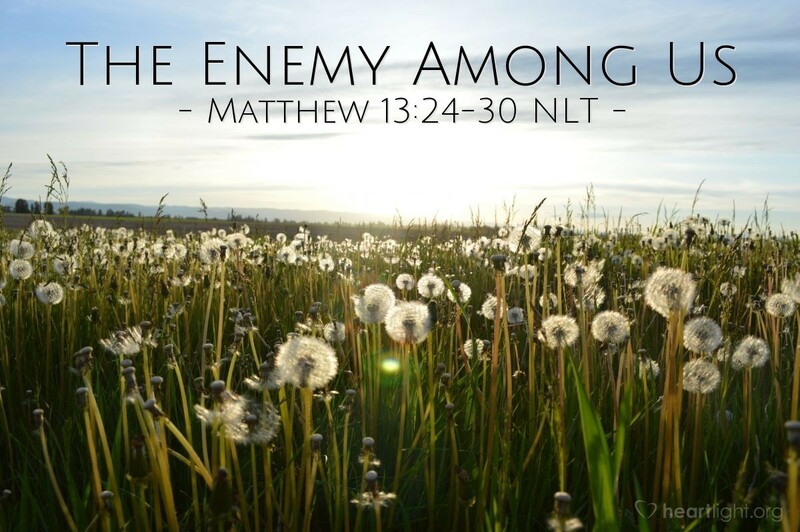 The man answered, 'An enemy planted weeds.' The servants asked, 'Do you want us to go pull the weeds?' The man answered, 'No, because when you pull up the weeds, you might also pull up the wheat. Let the weeds and the wheat grow together until the harvest time. At the harvest time I will tell the workers this: First gather the weeds and tie them together to be burned. Then gather the wheat and bring it to my barn.'" Jesus is back among the crowds teaching in parables again. He is once again using images from agriculture which they would instantly recognize. But the connection with the Kingdom is what they miss. Once again, Jesus will later interpret the parables in private. What we can immediately see again in this parable is the work of the enemy. Jesus' work, Jesus' disciples, and Jesus' Kingdom exist in a world which is under attack from Satan. He will allow no good work of Jesus to go unopposed. His goal is to corrupt, pollute, and undermine the work of Jesus. He wants to dilute the life of witness by the disciples. He uses the cover of darkness to do his vile deeds. Jesus does not leave his first disciples, nor us, under the illusion that his power will make things easy and that people will just flock to him to be changed by him. From the beginning he reminds us of the opposition and the problematic issues of false disciples. Jesus is aware that his Kingdom will face corruption from the evil one, so we must be ready as well. Almighty God, El Shaddai who thundered forth at Sinai, show your power today and bind Satan's power for a time and strengthen and bring renewal to your people. We fervently pray for true Spirit-led revival in our hearts, our homes, and our nations. In Jesus' name we pray. Amen.